The energy and water markets are experiencing substantial change (regulatory change and increasing pressures, new entrants, technology-led innovation, greener generation mix, reduced profits) combined with increased security of supply concerns, more volatile commodity prices and sustained rising network charges.Acting together, we can achieve better value and also deliver social and environmental benefits. If we do nothing, the cost of our energy and water will simply go up.We need to change our energy and water management practice and approach to the market. New tools, templates and guidance documents, resources, workshops, events, peer-to-peer working and networking opportunities. 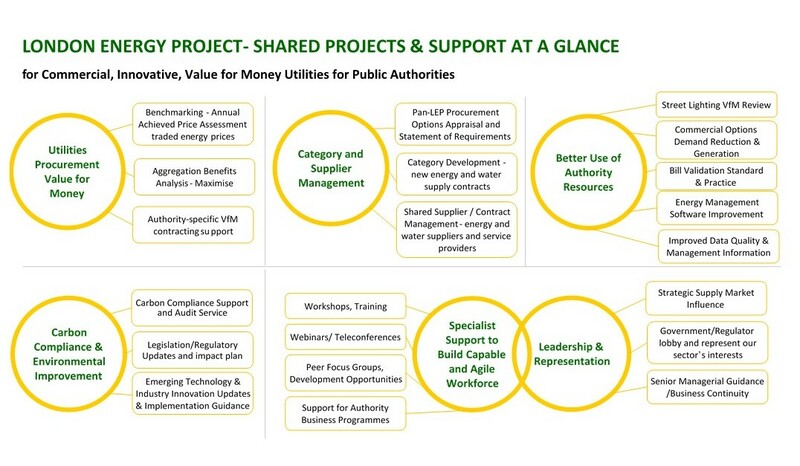 The LEP’s comprehensive programme of stakeholder engagement includes colleagues from the energy, finance, procurement, environment, estates and asset management teams in our Member Authorities. This ensures our projects, support and joint procurement meet all of our authorities’ needs, across all authority functions. We see this as a critical success factor. We believe there is still much to do and significant gains to make. We know there is Strength in numbers and Opportunities for Public Authorities working within the London Energy Project, and would like to extend the benefits of working together to authorities in the South and East of England. To find out how to be become an LEP member, contact us at: LondonEnergyProject@haringey.gov.uk or call 020 8489 1102.